I tried 2 varieties of Blasted Shreds: Cinnamon Toast Crunch and Peanut Butter Chocolate. I preferred the Peanut Butter Chocolate variety. I was immediately overcome by how heavy the cereal boxes are. A similar sized box of classic Cinnamon Toast Crunch weighs about 16 ounces. A box of Cinnamon Toast Crunch Blasted Shreds weighs over 23 ounces. With such density, I was expecting a very hearty cereal. When eaten dry, Peanut Butter Chocolate Blasted Shreds may be one of the best dry-cereal-as-a-snack experiences I've ever had. If you've ever had Chex Muddy Buddies aka Puppy Chow... it tastes just like that (without the dusting of powdered sugar). It's a real treat. Cinnamon Toast Crunch Blasted Shreds were fine as a dry snack, but not nearly as impressive. Both cereals retain a bit of crunch for about 5 or 6 minutes in milk. Both are very filling. I'd recommend filling your cereal bowl about 1/2 as full as you would with other cereals you eat. Cinnamon Toast Crunch Blasted Shreds have a big cinnamon punch (just short of overwhelming). The flavor is more bold than in regular Cinnamon Toast Crunch cereal. This new cereal is just slightly too sweet. If the sugar was reduced 20%, it would improve the overall flavor. The milk left at the bottom of a bowl is dusted and infused with visible cinnamon sugar, but it's not as flavorful as it would appear to be. 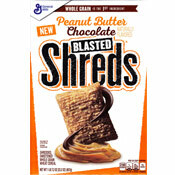 Peanut Butter Chocolate Blasted Shreds are really terrific. There's no distinct chocolate flavor juxtaposed against peanut flavor. It's a no-apologies combination of chocolate and peanut butter that tastes great. The flavor that blew my socks off when eaten dry gets muted somewhat in milk, but it's still really enjoyable. The milk at the bottom of a bowl is speckled with chocolate peanut butter coating. Strangely, this is where the flavor of chocolate dominates and peanut butter flavor is hardly noticeable. 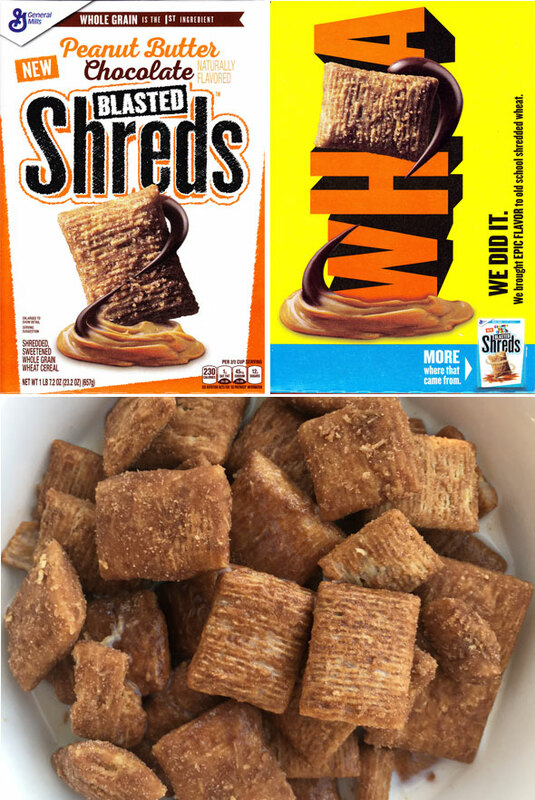 Overall, I preferred Peanut Butter Chocolate Blasted Shreds over the Cinnamon Toast Crunch version because the flavor is better and seems more integrated into the biscuits. I prefer original Cinnamon Toast Crunch over both these new cereals. But in the end, Blasted Shreds are something you should try. Please Note: The $0.00 price shown below indicates that sample boxes of these products were sent to us by the company. What do you think of Blasted Shreds? 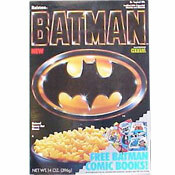 I loved this stuff! I found it was the right balance of shredded wheat and cinnamon. I�d give it 100 Stars if I could! 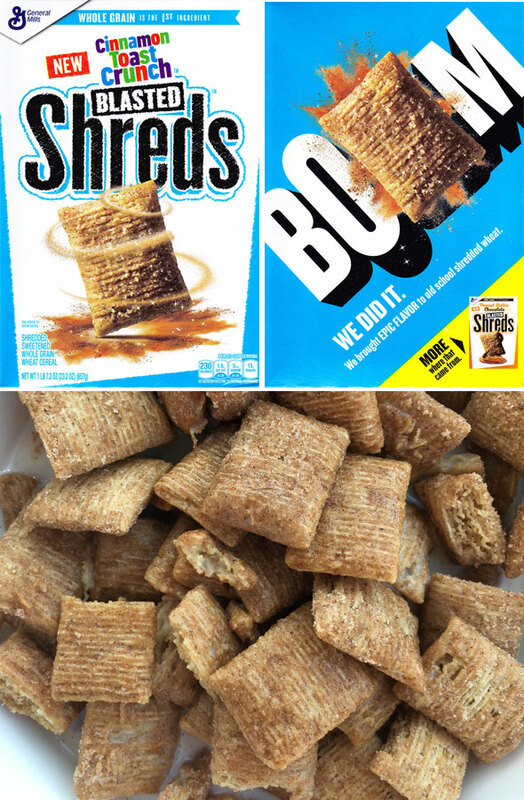 I tried Cinnamon Toast Crunch Blasted Shreds as a replacement for my favorite Honey Nut Shredded Wheat that apparently has been discontinued. I ate 1/2 a bowl and threw the rest away. I like cinnamon but this was too much. A waste of money. Glad I used a $1.00 coupon.